When I began commuting to Derby in 1976, I travelled on a number of occasions with another Coventry based Engineer I’d not previously met who was running another project at Derby. That project finished in 1977 several months before mine. Back in Coventry in early 1978 I learned that he had been transferred to Grimsby. Meanwhile I had no substantial task. A couple of the projects I assisted on took me to the noisiest work places I have ever known – fortunately for only a brief visit – I can not begin to imagine what it would be like to spend eight hours in such an environment. One was a weaving shed in Skelmersdale where I went to investigate a problem with yarn breaking because of the air conditioning system not maintaining optimum humidity. I recall a vast shed filled with looms as far as the eye could see and a noise that I can only liken to what it might be like to be inside an aircraft engine. The other noisy environment was a wire winding shed. One of the principal markets for the company’s original product, rayon fibre, was as tire cord. By the seventies rayon was being replaced in many tires by steel cord. Courtaulds had purchased a steel tire cord manufacturer and we were asked to look at some proposed improvement or other. Again my recollection is of a vast shed filled with machines that took thin strands of brass plated steel wire and twisted them together to form the cord. And, again, I recall a thunderous roar that vibrated in my chest, never mind its effect on my ear drums. These memories remind me of the many different products that Courtaulds had in its portfolio at the time and might be worth mentioning before we leave the 1970s. I mentioned in a previous episode that in the mid-sixties Courtaulds had fought off a take-over bid from ICI. The resistance had been led by a director who was a Chemist. ICI’s interest was in gaining access to Courtaulds’ considerable reserves of cash resulting from the forced sale in 1941 of it’s American subsidiary as part of an agreement, called “lend-lease”, under which the USA supplied the allies with war materiel and other goods free of charge. With the battle with ICI won, the Chemist became Chief Executive and used that cash reserve to embark on a series of investments. One facet of this strategy was the purchase of companies whose businesses complemented Courtaulds’ own. In particular they adopted a policy of ‘vertical integration’. Put simply, this involved the taking over of businesses that used Courtaulds’ raw materials, so it included weavers, spinners, worsted mills and garment manufacturers, many of them with household name brands such as Wolseley, Lyle and Scott, Bear Brand and Contessa among many others. In effect they were tying these companies in to buying their raw materials from Courtaulds at the expense of the enemy, ICI. At Courtaulds Engineering one of my colleagues headed up a Materials Handling section where conveyor systems and packing lines were designed and installed in many of these factories. Often branded products were produced alongside those bearing the labels of well known chain stores. Under the second element of the strategy, the Research and Development teams were funded to investigate new products using the same basic techniques as used in the manufacture of synthetic fibres. One such was KESP – spun soya protein as a substitute for meat. It featured on an edition of the BBC’s technology showcase “Tomorrow’s World”. Versions of the product appeared in the company’s shop and we tried it. As an alternative to stewing meat, the chunks were acceptable but needed a good seasoning of herbs and other flavourings. 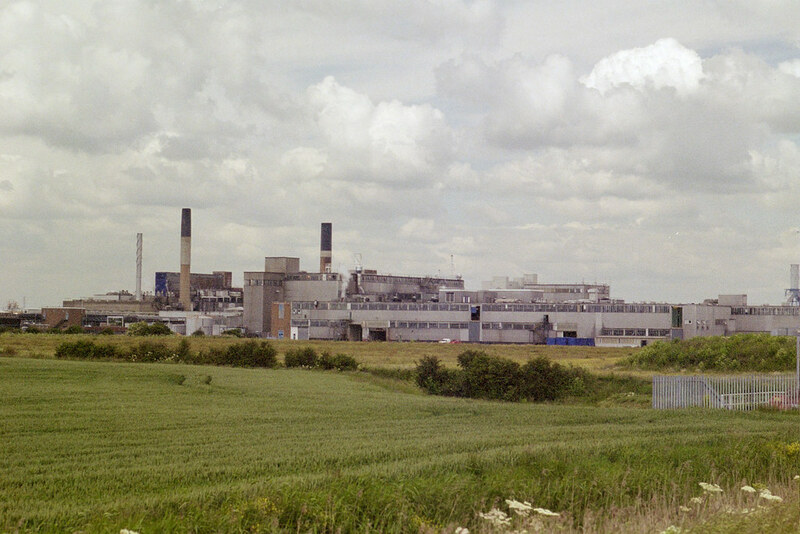 The pilot plant and manufacturing license were sold to a food processor in East Anglia but the product never achieved significant commercial success. Interestingly similar products are once again being offered for sale, no doubt in response to an upsurge in vegetarianism and veganism. Another attempt to introduce a new product into an established market concerned tobacco. I have no idea of the process used to manufacture Courtaulds’ tobacco substitute. Employees were offered the opportunity to blind test samples of different compositions. This must have been before I left for South Africa because I gave up smoking a few months after our return. I do remember that the particular formulation I was given to sample tasted horrible. The best way I can describe it is by reference to an occasion when I inadvertently lit the wrong end of a tipped cigarette. I remember once creating the script for an imagined TV commercial demonstrating, via a series of short clips, how every activity during an ordinary day in someone’s life brought him or her into contact with a Courtaulds product. The strap line or slogan would have been “We are all around you” and it certainly seemed at the time that Courtaulds had such a huge variety of products and brands that it was indeed impossible to avoid contact with the company, although most people would have been unaware of the ultimate ownership of those brands. I suppose the fact that I found time to indulge in such exercises as devising a TV commercial confirms that I did not have enough to do. That was changed by a phone call from the man who had occasionally given me a lift to Derby. He was now head of the capital projects department for the company’s Courtelle Division at Grimsby. Courtelle was the company’s acrylic fibre and the production facility at Grimsby had been steadily expanded over the preceding fifteen years. They had an annual budget for modernisation and improvement projects, one of which consisted of the complete overhaul of some of the older production lines. Each would be shut down for three months at a time, stripped down, major repairs carried out and new equipment incorporated. I was seconded for an initial period of six months to manage the work. By franklparker in Monday Memories on February 4, 2019 . In the 70s I worked on video crew. We made “Hard Hat” movies. Industrial safety films, shot in the petrochemical refineries of Houston, Texas. I also wrote the “soundtracks” and edited the foley for same. There was a sort of music in massive industry – the hisses and clangs and the big machines. Not everyday or everywhere you’re exposed to the really big factories and plants where really big things get done. Nice one. Thanks Phi. I’m glad you can find something in my little slice of what was a pretty ordinary life. Ordinary or not, that Grimsby plant looks pretty impressive.